“Mom looks tiny compared to the trees” – text message from my daughter to her father and husband. Little did she know I’d already taken a picture of her looking the same way as she went running that morning! 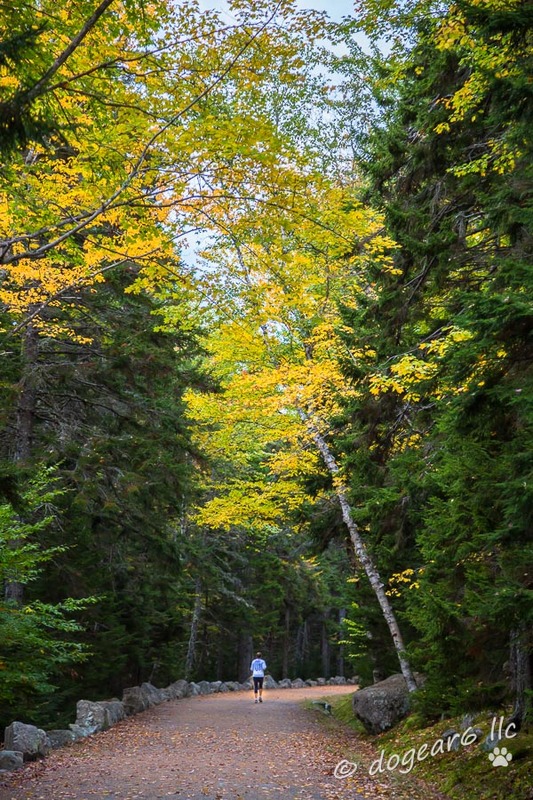 This picture was taken at Eagle Lake in Acadia National Park, Mount Desert Island, Maine. At some point, every writer wonders if his or her stories are important, and if anyone will ever care about them. . . I told him writing, like Tai Chi, was internal, not external. It is about feeling and honesty, if something wants to come out, it needs to come out. One has to set up a boundary, you write for yourself and you hope it has meaning to others, but when you write, you write only for yourself, you cannot be thinking about what everyone else might feel or say. Creativity is a coming out, a leap of faith, it is neither simple nor easy, but it can be profoundly rewarding. Two years ago, after I’d been blogging for nearly 1.5 years, I had a fairly major case of discouragement about the whole thing. I hadn’t yet thought out whether I was doing it for myself or for an audience, but I questioned whether it was worth doing in my limited time. When I start to feel small (like being in the woods at Acadia National Park), I look these lists over and think, I’m not doing bad. I did neglect my blog this year from January to July, mostly due to the need to take care of myself physically. That has improved and while I still need a good night’s sleep, I’m not as excessively tired as I was earlier this year due to some medication that I was on. I’ve made friends through my blogging, which has been wonderful. Following others, leaving comments, and receiving comments back is like having a bunch of penpals. During this 31 Day Challenge, I heard regularly from some of my blogging friends. It’s hard to believe we’ve known each other so long now. A few friends had been absent for a while and came back recently. One friend retired from her blog and I’m sorry she couldn’t see what I’m doing here. And I made new friends! We’re having fun encouraging each other through the challenge and reading what each of us is up to. There’s some incredible creativity out in the blogging world and I’ve enjoyed being part of it this month. But at the end of it all, I have to do it for myself most of all. My blog friends, comments and likes are all wonderful (thank you all again! ), but I have to be careful to not get too invested in them. Not every post elicits a good response but that doesn’t make it a bad post. Some of my posts don’t become important until later. One post that I’ve shared repeatedly when leaving comments is about the death of a pet. Another post that I often share is about being a working mother. I never thought those would be shared so often at the time I wrote them. Others, such as my daughter’s wedding and her baby bump is getting sent around not only to friends, but also to co-workers and consultants because we share our lives with each other and have gotten to know each other as friends and not just a client relationship. I didn’t expect to share those posts so frequently either. Recently, Colleen at The Chatter Blog had a wonderful post about singing because you have to sing. Her post is enthusiastic, contagious, and full of passion. That’s how I want to write and do my photography – to do it because I have to do it and want to do it. To do it whether I have an audience or not. To do it because it’s me and that’s who I am. And knowing that nurtures my creativity, especially on the days that I don’t feel like buckling down to do the work to be creative, the days I think this doesn’t matter, and the days that I want to just give it all up and be lazy. It’s much easier to be a passive observer than to do the work to be creative, the learning of new skills and techniques, and the frustration of failing when stepping out of my comfort zone. Yes, it’s easier, but far less rewarding in the end. Doesn’t that just sound wonderful and perfect? And not at all reality, when most night I don’t want to be here working on my blog, I don’t want to be creative. I want to just relax and unwind, but no. . . here I am, writing up another post. I’ll be glad for the last day of this challenge, but it’s also been satisfying that I am getting these posts written (and good ones too) and I am building a body of work from this challenge. Still catching up on reading! Such a great post – and something I’ve been thinking about recently. Hope you had a lovely Thanksgiving! That’s what’s great about reading each other posts. There’s so much encouragement and inspiration and I’m glad you found some here. We had a great Thanksgiving! We went to Atlanta to see our daughter and son-in-law. We hung out, went shopping, saw a movie (Hunger Games), and just enjoyed being together. I’m so glad you made the time for Maine, and kept right on blogging, too. It was hard the week before I left to put together two posts each night, but for whatever reason, the challenge really motivated me to stick with it. But yes, Maine was a great treat and I’m glad to have had the time with my daughter before the baby comes. You’re welcome. I had it stored in Evernote and wasn’t quite sure when I’d use it. I love your summary of what I’m doing here with asking questions, answering them for myself, and then coming up with new ones. That is what I’m doing! Good thinking. There is a lot of pressure in these daily challenges. I have decided not to take up the November challenge and to plan well ahead for Blogging from A to Z in April. Sue – thanks so much for the lovely notes of encouragement! I am so happy that you find my blog worth your time and effort to read. You’re right in your observations of how much pressure is in a daily challenge. I did two 365 challenges in 2011. It was good and it helped me learn my camera better and blog consistently, but I was glad when they were both done at the end of the year. I’ve enjoyed what I’ve done this month, but not how it took away from other things in my life. I should continue to blog every day after this, but I’m just not sure I really should spend this much time to blog daily. It’s easy to overdo the blogging, yet it’s so much fun and so much more satisfying than housework! I’M SO GLAD YOU ARE DOING THIS TOO……..I HAVE ENJOYED READING THEM….. Thanks Mom (wow, you’re up late)!